Nokia Lumia 2020 with 8.3in 1080p screen coming soon? 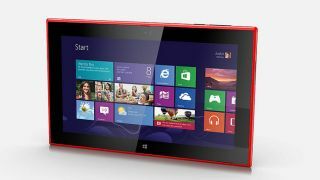 Now that Nokia's got its first Windows RT slab – the Lumia 2520 – out on the shelves, we're all eager to see what its next tablet plans are. Talk of an 8-inch Lumia 2020 has come up before, and the rumours are now looking more even more likely with a certain Nokia RX-115 having just shown up. Clocking in with an 8.3-inch Full HD IPS display, it would seem this is the mystery "Illusionist" that we've been hearing about. The tablet was imported to India last month for testing and was spotted in some testing documents and posted over on Zauba.com. The RX-115 is described as a "cellphone" in the report, but with that 8.3-inch screen it's safe to say that this is very much in tablet territory. We can see that the device will have a nano-SIM card, which might explain all that phone business. There's no explicit mention of Nokia in the description but the RX-115 has appeared before in a family of Nokia Windows 8 devices, as spotted by Windows Phone network blog Adduplex. Is the Nokia Lumia 2520 a keeper?